New York City's Times Square is a mecca of advertising. On any given day, hundreds of thousands of people from around the world visit the site, and countless news and entertainment broadcasts take place on its busy sidewalks. And considering the number of movie scenes filmed in Times Square, it's safe to say that it receives its fair amount of exposure. Through it all, an eye-dazzling number of billboards and digital displays jockey for attention, advertising everything from M&Ms to Broadway plays. And these days, American Eagle Outfitters is doing its part to add to the excitement of Times Square—while helping to advance the use of digital signage. American Eagle Outfitters, a popular clothing and accessories retailer that was founded in 1977, is on the cutting edge of digital signage advertising. To promote both its American Eagle and Aerie brands, it uses digital signage in its stores and in outdoor displays. But the company didn't always use this type of technology for advertising. 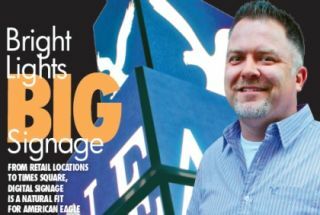 As Dave Taylor, audio/visual engineer at American Eagle, explains, the company's first foray into digital signage was at its Home Office in Pittsburgh. There, they installed two video walls: one to welcome guests, and another to communicate with employees. After the success of the Home Office installations, the idea of digital signage was embraced, and the company expanded video communication to its distribution center as a video bulletin board for employees. “Our distribution center is open 24 hours a day, so it's good to have a digital way to bring messages to everybody,” Taylor said. The video walls and bulletin boards were very well-received by American Eagle's employees and guests, so the forward-thinking company decided to think bigger. The company just needed to find the right outlet to communicate with its fans—and to attract new ones. The American Eagle Times Square display is a massive 15,000-square-foot Barco LED billboard—one of the largest in the city of New York, according to Taylor. The display features American Eagle advertising and other video content, plus the occasional ad from the company's advertising partners. American Eagle chose Barco monitors for Times Square, and uses Sedna Presenter software to manage the system. The impressive billboard helps attract a steady stream of customers to American Eagle's flagship store, which is conveniently situated in the heart of Times Square. There, a 21-monitor video wall greets visits, while a video projector shows off the Aerie brand on the store's third floor. Not surprisingly, the store—and the billboard—has been a huge success. And Taylor is in the middle of it all, managing the display's content and working with other American Eagle departments to implement exciting new technology enterprises. Fittingly, his office is actually in Times Square, so he has a front-row view of the billboard, the store and their day-to-day successes. Thanks to the popularity of the Times Square billboard and store, the company has expanded the audio/visual platform to its other domestic flagships. Soon enough, their international flagships will feature the technology as well. As American Eagle continues to grow its digital signage efforts, Taylor and his team are excited to continually innovate. One of his favorite recent projects involved making use of social media on the Times Square billboard, during the area's biggest night of the year—New Year's Eve. Facebook users who were in Times Square for the New Year's festivities could opt in to American Eagle's program, which drew information from each user's Facebook page and displayed it, for all the world to see, on the company's enormous billboard. Fans from all over the country were able to see their favorite Facebook photos and fun facts about themselves, beautifully broadcast on the Barco LED screen, with thousands of other viewers looking on. Taylor and his team take advantage of the versatility of the Sedna Presenter software when working with social media. They tailor their approach depending on the application, or the advertiser. Taylor said he and his team learned a lot through the deployments of their current digital technology. And they look forward to applying those lessons as they expand American Eagle's digital signage network. For example, when implementing digital signage in the company's Soho location, the team learned a hard lesson as they realized they couldn't install cabling—which could have derailed the entire project. Another challenge has been keeping up with the rapidly-evolving technology landscape. Luckily, Taylor's team is dedicated to staying abreast of new innovations. Looking ahead, Taylor sees a bright future for digital signage at American Eagle. And he and his team are excited to see where the technology takes them. In the company's latest ad campaign, customers can enter contests to be featured as an American Eagle model—if only for a little while. The project has highlighted customers who are artists, DJs, skateboarders and more, giving other customers a look into their own unique worlds.